Essay on Architectural Design magazine and its look at the United States in the 1960s. Related research was presented at the conference Architectural Periodicals in the 1960s and 1970s organized by the Canadian Center for Architecture and the Institut de Recherche en Histoire de l'Architecture (a Montreal consortium). IRHA later published the book Architectural Periodicals in the 1960s and 1970s: Towards a Factual, Intellectual, and Material History (2008), which included my essay "'The Fountain of Technological Culture': Architectural Design and America, 1965-1969". 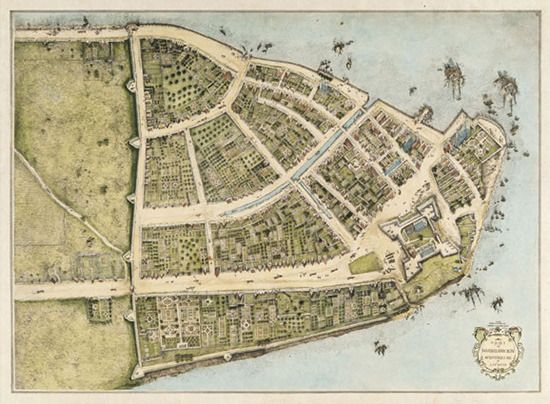 This study traces the built environment of New Amsterdam, the Dutch colonial port that became New York in 1664. Social and economic struggles as well as topographical and ecological conditions are investigated as sometimes contradictory motives for building structures, canals, and streets. Initial development of lower Manhattan only loosely followed the plans of the Dutch West India Company as it strained without success to earn profits from New Amsterdam and to maintain control over the colony. Lenape Indians resisted colonial expansion and, along with rival Indian groups, simultaneously furnished the means for the colony's sustenance. Buildings such as the dilapidated fort and the tavern-turned-statehouse help narrate the frustration of the company's authority and the political ascendancy of the merchants unaffiliated with the company. Visual and written chronicles offer crucial clues to the port's geography, and also reveal the ideological justification for the colonists' appropriation of occupied lands. From the volatile environment of the colonial encounter there emerged a set of streets in lower Manhattan that have survived into the present. Redraft of the Castello Plan New Amsterdam in 1660. 1916. John Wolcott Adams and I.N. Phelps Stokes. New-York Historical Society Library, Maps Collection. This thesis offers both a celebration and defense of the working class tavern. It represents a “cry and demand” for its preservation and proliferation in twenty-first century American urban form. The American tavern has been a vital seed in revolutionary change throughout our country’s short history. It possesses unique characteristics when compared to similar social spaces, and features the most vital of public personalities. Over the course of five chapters I consider the role of third places in abating the concurrent crisis of community, examine the historical relationship between tavern sociability and revolutionary movements in the U.S., France and England, analyze tavern ethnographies within American sociology, and theorize the function of public space in relation to original observations on tavern culture. Based on this analysis I conclude with several recommendations to enhance the viability of tavern preservation and development, and thus, tavern life in the 21st Century. Ultimately, I argue that working class taverns represent one of the last bastions of Gemeinshaft – spontaneously arising social relationships – in an increasingly individualistic U.S. society. Working class neighborhoods, where they exist, are threatened by gentrification and developers’ emphasis on encouraging spaces where members of an elite “creative class” comes together to hatch brilliant innovative schemes. In the end, I theorize a more vibrant and democratic public sphere modeled on the life and culture of the working class tavern, a time-tested nurturer of the sense of community and diversity that so many prize in an ironic era defined by unabashed individualism and consumption-driven conformity.